DIAL: Black glossy dial with luminous hour markers. Date window at 3 o'clock. Gold color hands with luminous center. CONDITION REPORT: Mint condition. The case is unpolished and only shows slight signs of wear. The dial and hands are in excellent and original condition. The crown is a single piece, indicating a later production improvement/update versus the earlier two piece crowns with a cap. NOTES: In 1962, rare diving watch was developed by Triton for Spirotechnique, Jacques Cousteau’s renowned French company that supplied gear for scuba diving. 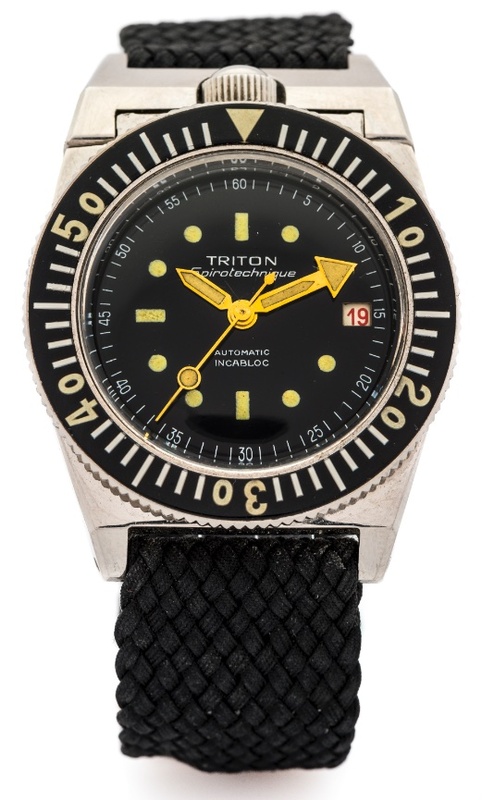 It is speculated that Triton may also have been commissioned to make watches for military purposes. This diver has a unique look with its crown at 12 o'clock and flexible crown guard. The large bakelite bezel and bold arrow hands pointing to thick tritium plots on the dial shows is quintessentially representative of the early 1960's. Also, known from a French advertisement from 1963 showing the Triton was more expensive at the time than a Rolex Submariner. French divers are credited with being the catalyst in the diving wristwatch development in Switzerland. Starting in the 1950's with Blancpain, Rolex and later Omega, the connection between the needs of divers and the swiss quality in making precision tool watches is legacy that continued through the 1960's with the Marine National Tudors, COMEX connection to Omega and Rolex and and so on. Even today, divers are one of the most popular categories among wristwatches.